The Aztecs and other Mesoamerican cultures believed that several successive worlds had existed before ours, and each time mankind had been wiped out by some catastrophic event. This series of worlds were called the “Four Suns,” and the age that we now live in is the fifth. The ancient Aztecs believed that two beings were the origin of everything. This included the origin of the gods themselves. They were Ometecuhtli, “The Lord of Duality,” and Omeciuatl, “The Lady of Duality,” and they lived in the thirteenth heaven at the top of the world. The Aztecs believed that the top of the world was a very cold place. This cold place was where mankind was born, and the gods created by Ometecuhtli and Omeciuatl were the creators of earth. Their most important act was the birth of the sun which was born from sacrifice and blood. To keep the sun revolving, so that the world did not go black, it was necessary to sacrifice humans. Human sacrifice was not inspired by hatred or cruelty. Instead it was viewed as a necessity, so that the people on the earth could be saved. The sacrificial victim was believed to be a messenger who was being sent to the gods. The ancient Aztecs had very little faith in the future. Life for the Aztecs had been very difficult, one famine after another. The supreme god of the Aztecs was called Uitzilopochtli. 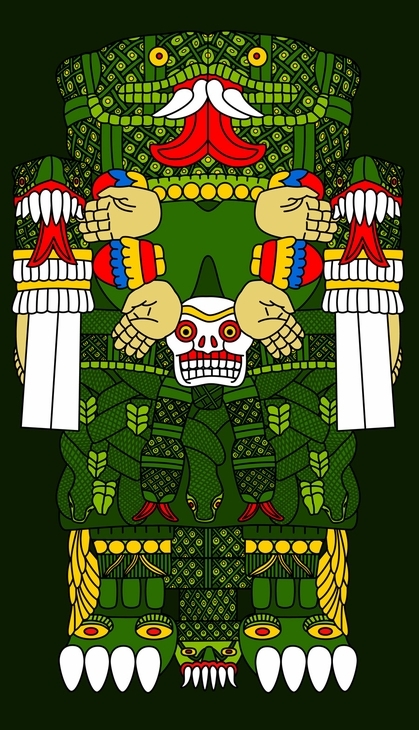 Uitzilopochtli was the god of the sun at its brightest, and his mother was called Coatlicue. His importance grew as the Aztecs conquered more and more territory. Tlaloc, was also deeply respected with his mask of snakes. He was the god who piled clouds on mountain-tops and made it rain. Also important was Tezcatlipoca, the god of the night sky. The Aztecs willingly adopted the practices, myths, and gods of other provinces and cultures. For example, the god-king Quetzalcoatl finds its roots deep in the Toltec civilization. At the time of the Spanish invasion Quetzalcoatl was one of the most important gods. It is believed that Quetzalcoatl was once a true person. He was the king of the Toltecs. As the legend tells us his name was originally Topiltzin, and he ruled over the Toltecs for nineteen years. He was against human sacrifice. The Aztecs had a different god for almost everything. Every guild,craft, neighborhood, province, and natural event had its own god. Aztec priests were extremely powerful in Aztec society. They possessed the sacred calender that regulated the performance of agricultural tasks. Priests were called to intervene in almost every crisis because they were believed to have special powers and the ability to communicate with the gods. The priests were treated as nobility.